What’s the best way to show your clients how much you appreciate them? If you’re looking for a unique and unforgettable way to show your clients that their business means the world to you, book an event on a private yacht in stunning New York harbor. Many companies offer the same old routine by taking clients out to dinner, but when you plan a unique experience aboard a luxury yacht, you’re making a grand statement about how much you value their business. At Metro Yacht Charters, our experienced event planning team will help you create a custom, one-of-a-kind event your clients won’t soon forget. We’ll assist you in planning your entire private yacht event, from menu selections, to wine, to entertainment and decor. Want to impress clients with an upscale menu, complete with sushi bar and overflowing displays of jumbo shrimp, lobster and crabs? 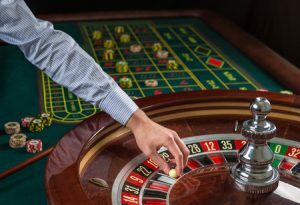 Or maybe you’d like to host a casino themed cruise, with blackjack, Texas hold ’em and roulette tables, or, a Cuban-themed cocktail party with cigar roller and live Latin Band. Perhaps you prefer to unwind with a casual dinner cruise and a Live Jazz trio. No matter what type of event you’re envisioning, we have the perfect yacht and professional staff ready to go! Entertaining those special clients is one of the best ways to bond and show you appreciate their business. Why not do it is style! Call Metro Yacht Charters today at 646-780-9693 and let us help you raise the bar on your client entertaining needs! Weddings are a beautiful celebration of love and eternal commitment, and the way you choose to tie the knot says a lot about you as a couple. You could go the traditional church route and still have a lovely wedding, or instead choose something completely unforgettable and have your wedding aboard a one-of-a-kind yacht. The end of the year is nearly upon us; have you shown your employees the appreciation they deserve yet this year? If not, schedule a cruise with Metro Yacht today! From birthdays and anniversaries to retirements and graduations, special occasions deserve recognition and celebration. Whether you are celebrating another year of life or the end of your many years of hard work, it is time to treat yourself with a different kind of party. More and more, the elite class is being welcomed once again to New York City, a metropolis that cannot be rivaled. Anyone who has ever visited Manhattan knows that, although certain stalwarts will always be here, most of the city’s skyline is ever changing, with dozens of construction and renovation projects being undertaken at any time. Springtime in New York is one of those crazily inspiring things that we completely take for granted. If you’re a local, it’s easy to forget the bigger picture as you’re rushing to catch the express train! Every year, millions upon millions of tourists visit New York City to see some of the most engaging sights in architecture and art that can only be found in this metropolis. The five boroughs of this city are home to renowned museums, cultural institutions and many locations that are brimming with historical significance.